In this digital Monkeybrain comic gone physical via IDW, D4ve a former defender robot turned desk clerk, navigates his mid “life” crisis while his world teeters on the edge of a crisis of an entirely different and, alien, nature. Ferrier’s writing is sharp and riotously funny. 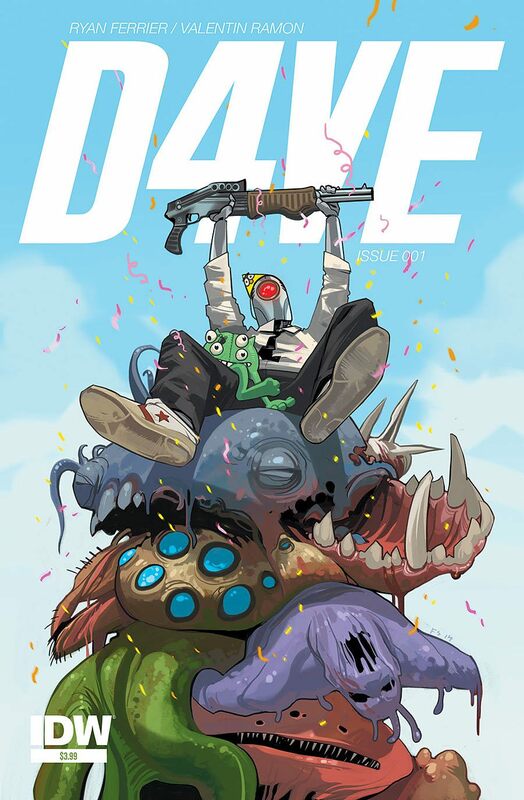 D4ve’s story is one that has been told many times across a number of different mediums but Ferrier still finds a little bit of the wiggle room to bring it a new, crisp energy in the guise of one downtrodden robot’s story. There’s a good deal of commentary on both human life and, the nature of technology. D4ve himself is pretty likeable, too, considering he and his “people” were responsible for our utter destruction. Ramon’s art is crisp and clean but avoids a manufactured, robotic feeling. Artistic decisions like the fact that the robots wear clothes make it painfully obvious that this is really a lesson about humanity but it doesn’t detract from the story in any way. There’s a number of visual gags and some cool alien design that make each page at least as interesting as the last, too. This is a crisp, fun book that hinges on an old narrative structure but carries an important lesson. If you missed out on it digitally, you don’t want to now.